The 1856-D Coronet Quarter Eagle is the rarest date to come out of the Dahlonega Mint. The Coronet Quarter Eagle was first issued in 1840, and was produced continuously without change until 1907. One of the rarest dates in this lengthy run is the 1856-D Coronet Quarter Eagle. Only 874 pieces were coined, the smallest of any date from the Dahlonega Mint. Of the original mintage, fewer than 50 examples survive to this day. All 1856-D Quarter Eagles are poorly struck. Most of them appear to be cleaned, even if they were not, making grading very difficult. Most examples have below average eye appeal. In spite of mediocre aesthetics, not many coin collectors spurn the 1856-D. It has always attracted a crowd because it is the rarest coin ever to come out of the Dahlonega Mint, one of the most interesting chapters in US numismatics. 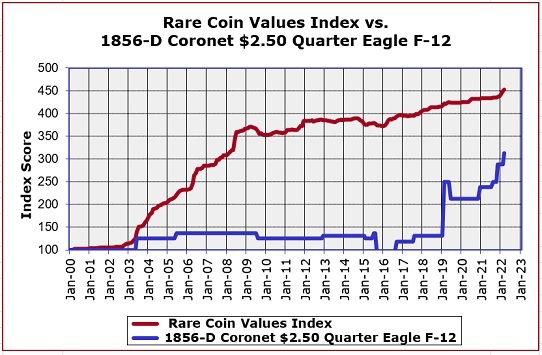 The 1856-D Coronet Quarter Eagle is widely acknowledged as one of the key date Coronet Quarter Eagles, but you'd have a hard time believing it by analyzing the graph above. The blue line depicts the percent value increase of the 1856-D (in F-12 condition) since the baseline year of 2000. The percent value increase has been very flat. One would not expect this of a rare, key date gold coin from the Dahlonega Mint. The red line is the percent value increase over the same time period of the Rare Coin Values Index, which tracks the combined percent change of a cross sectional group of 87 rare US coins, the purpose of which is to understand the strength and direction of the overall rare US coin market. The 1856-D Quarter Eagle is one of the 87 coins in the Index. All Index charts are updated monthly.